Joanne Julian, "Seven Cranes Triptych" (right panel), 2016, acrylic, graphite on Arches paper, 30 x 22"
Darkness is a many layered thing. Because we do not see well in the dark, it easily becomes the emotional and psychological representation for all that is unknown, hidden, forgotten or lost. For that reason darkness often resonates mainly as a space of vulnerability. Against it we huddle around campfires and line our roads with streetlights, pushing back the dangers concealed by the deep unknown in which we are almost blind. But it is the challenging wonder to be found in getting comfortable wandering in the dark that we gather from artist Joanne Julian’s most recent artworks in “Defying Darkness.” Her mostly monochromatic mixed media works on paper present the nocturnal world as a silent but animated space filled with all kinds of motion and life. Pointedly, it is never completely still or dark. Rather it’s a dynamic space, filled with flying or fighting birds, a stiff blowing wind that shreds glowing leaves, and quick spontaneous gestures caught in dark ink or paint. Because the artist is intrigued by Zen aesthetics, her works often incorporate bold calligraphic strokes and splashes of ink that she then uses as a ground for recognizable images. But further, like a Buddhist koan that obliquely points us toward something we may still puzzle over, Julian’s images also seem to probe at our assumptions about the dark as a blank emptiness along with our desire to always be certain about what we are seeing. The pale Koi in “Ghost Fish” suggest something visually akin to almost pure myth. They cruise slowly, their backs lightly skimming through the reflective surface of a black, star specked pool that might also be the night sky. Floating between the infinity of reflected space above them, and the invisible depth below they move like living glow sticks, peacefully illuminating and searching through both heaven and sea. Sometimes the artist presents darkness as a space of transformation, as it is in the acrylic, graphite and Prismacolor drawing on paper titled “Silver Snake." In this work an incredibly long, thin reptile is suspended like an uncertain vision seen by moonlight. At one end it could really just be an ordinary piece of grey rope draped over a tree branch. At the other however is the animal’s small head. As if doing a fan dancer’s strip tease, three loose bird feathers are falling past the sinuous, arcing body, concealing yet revealing a tantalizing moment of change. As intriguing as these images are, it is when the artist combines her ambiguous narratives with hoboku (meaning ‘flung ink’ style) Zen painting that we feel the powerful push and wild poetry in leaving certainty behind. Her use of a quick, spontaneous calligraphic gesture that she then overdraws with tight, resolving detail transforms empty space into a dynamic and pregnant arena of meeting and mystery. The large white page in “The Confrontation” is charged full of energy by some slashes of black ink pressing against one corner. Her pencils admirably turn those shapes into the feather-shredding battle of two warring crows. 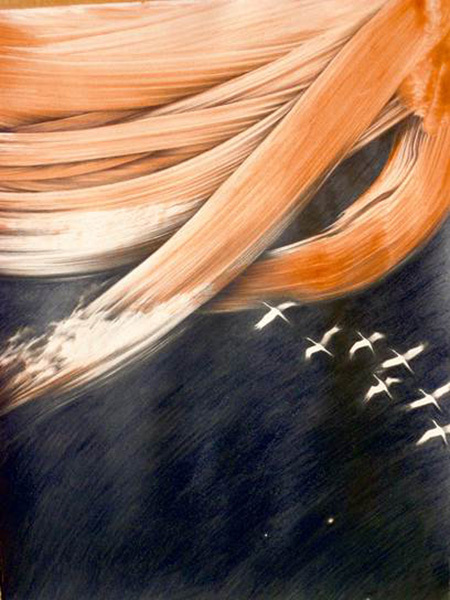 And the massive, orange tinged, brushy swipes she threw down to fill the top third of the large “Seven Cranes Triptych” effortlessly gives depth and multiple meanings to the dark sky she has penciled in below. Indeed, suggesting the very changeability of the sky itself those glowing swipes flex between being the driving motion of a rushing wind, the radiance of lightening-cracked heavens, and even columns of bright rain falling like thick strands of human hair. At one point we are looking out towards the stars, at another checking swirling clouds for a storm. But finally we arrive at the last panel, the “Seven Cranes Triptych,” the formation of small white cranes coming out of nowhere; seeing them just as they are about to disappear. The moving sky they are aimed for seems to reach out a thick filament to enfold them. We find ourselves wondering where they are going.